When Carlos Santana and Rob Thomas released ‘Smooth’ in 1999, it spawned three Grammy awards, epic chart success and catapulted Thomas to solo stardom. 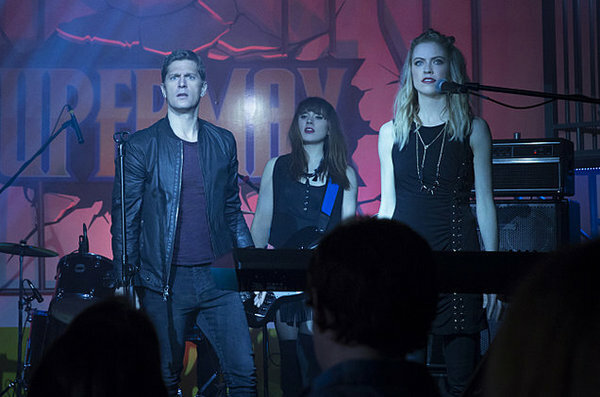 But on the other side of the US, another Rob Thomas’ life would also transform – that of the Veronica Mars and iZombie creator, who shares the same name as the Matchbox Twenty frontman. “It did not matter that much that I shared a name with Rob Thomas, then when he did ‘Smooth’ with Santana, that changed both our lives,” laughs TV Thomas of his musical namesake. “My life became quite different after that song. For singer Thomas, the case of mistaken identity affected him, too as TV Thomas’ series Veronica Mars evolved into a cult hit. The pair finally made contact after a friend of TV Thomas met singer Thomas at a wedding. A playful social media banter started and DMs were exchanged, then when iZombie writers needed someone to sing the Super Max jingle in an ad featuring Vaughn (Steven Weber), one clever cookie immediately suggested musical Thomas. What the CW show’s team didn’t realize was that Thomas was such a fanboy of the series that he wanted to shoot the finale – on which he performs the jingle at a Super Max party – without plot spoilers. “We sent him the script and he emailed me saying, ‘Is there anyway I can watch the rest of the episodes so I can see them without being spoiled?’” says TV Thomas. Spoilers aside, musical Thomas was “ready to move anything” to make the cameo happen, flying to the show’s Vancouver set straight after getting home from a controversy-filled tour of Australia. The tour, for his solo record The Great Unknown, saw Thomas slammed for being racist after making unintentionally offensive remarks on-stage. Unaware of the cultural stereotype of the country’s native Aboriginals drinking excessively, Thomas cried in his hotel room after realizing he had caused offense, but now says he’s glad he said what he did. “There’s a moment where you do something and for a day or two you would give anything to take that moment back, then a couple of weeks later as I’m leaving Australia I realized I wouldn’t change it for a second. A favorite place to visit and one of Matchbox Twenty’s key markets, Thomas admits he was surprised to find himself under attack so quickly in Australia. “I talked to activists and tribal leaders who saw the entire statement I made and realized there was no racist intention in anything that I said. I was more disappointed in the media there for not giving me a fair shake, but in the end the people who really mattered and who I was worried I offended were the ones who reached out and gave me their hand. Thomas looks forward to returning Down Under, the next visit possibly with the band as they celebrate a Matchbox milestone. October will mark 20 years since the release of their smash debut album Yourself or Someone Like You, and while guitarist Kyle Cook announced his departure from the group on Friday (adding that he had informed his bandmates several weeks ago) and Thomas then declared the band’s future “on hold”, he told Billboard [on March 30th] that he hoped to commence plans for a YOSLY anniversary tour once he wrapped touring his solo record this summer. Thomas said he envisioned re-releasing the record then embarking on a tour where the Grammy-nominated group performs the entire album. “There are songs on that record we haven’t played for over 15 years, so it would be nice to play the record beginning-to-end, then play stuff from other albums and maybe something new. “‘Busted’ was a song we used to play every night then we just stopped. I think at some point as you get older there’s a dark and brooding part of you that you just don’t have as much of anymore – that applied angst you had when you were young and weren’t really sure what you were mad about, but you were just mad all the time!